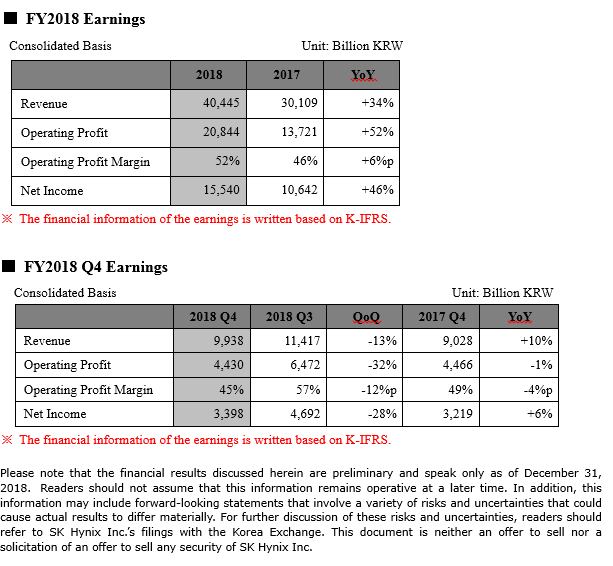 Seoul, January 24, 2019 – SK Hynix Inc. (or ‘the Company’, www.skhynix.com) today announced financial results for its fiscal year 2018 and fourth quarter ended December 31, 2018. The Company reported record-high annual revenue, operating profit, and net income for the second consecutive year. The Company’s consolidated sales of fiscal year 2018 totaled KRW 40.45 trillion won, while operating profit amounted to 20.84 trillion won, and net income was 15.54 trillion won. Operating margin for the year was 52% and net margin was 38%. Last year, memory market conditions continued to be favorable, driven by high demand for data centers and high-performance mobile devices. SK Hynix actively responded to the demand for high value-added products and has achieved the record-breaking business results once again. However, as memory demand slowed down in the second half and the supply shortage was resolved, the memory market environment rapidly changed. As a result, the consolidated fourth quarter revenue fell by 13% quarter-over-quarter (QoQ) to 9.94 trillion won, while operating profit amounted to 4.43 trillion won, down by 32% QoQ with operating margin of 45%. Net income for the quarter fell 28% QoQ to 3.4 trillion won. Quarter-over-quarter, DRAM bit shipments declined by 2% and the average selling price by 11%. For NAND Flash, the bit shipments increased by 10%, but the average selling price fell by 21%. SK Hynix plans to concentrate on high value-added products and technologies in order to prepare for the rapidly changing market conditions. The Company will expand its customer base of 16Gb DDR4 products to increase the adoption of high density DRAM modules by server customers. It will also actively respond to customer demand for HBM2 and GDDR6 products with high growth potential. In order to focus on technology migration, the Company plans to expand the proportion of 1Xnm DRAM and to ensure stable mass production of 1Ynm DRAM. For NAND Flash, the Company intends to further strengthen its position in the enterprise SSD and mobile market based on its 72-layer 3D NAND, while maximizing profitability by mass producing the 96-layer 4D NAND at the right time. SK Hynix has decided to pay its shareholders 1,500 won per share in 2018 in the form of a cash dividend, which is increased by 50% compared to the last year. SK Hynix Inc., headquartered in Korea, is the world’s top tier semiconductor supplier offering Dynamic Random Access Memory chips (“DRAM”), Flash memory chips (“NAND Flash”) and CMOS Image Sensors (“CIS”) for a wide range of distinguished customers globally. The Company’s shares are traded on the Korea Exchange, and the Global Depository shares are listed on the Luxemburg Stock Exchange. Further information about SK Hynix is available at www.skhynix.com.